My biggest success was with two types of blanket flowers (Gaillardia aristata) from Swallowtail Garden Seeds: Mesa Yellow and Red Shades. Both varieties bloomed right up until frost. Best of all, they are perennial in my zone. 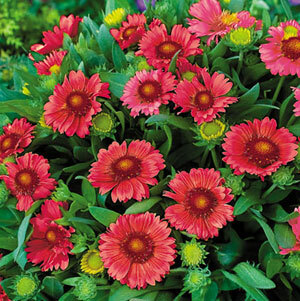 It’s unusual to get perennials to bloom from seed in the first year, but gaillardia is reliable that way — as long as you start them indoors in early spring. For more options, read Grow Perennials from Seed. Sunset hyssop (Agastache rupestris) has flower spikes that resemble salvia but the blossoms are orange and the whole plant smells like anise. The seed packet from Botanical Interests says, “Unique root beer scent,” and I agree. 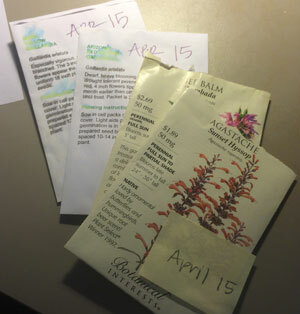 Next year, I’d like to try another type of orange agastache, maybe Arizona Sandstone or Tango. Most of these orange varieties are not winter-hardy in my zone, but they are so easy to grow — with flowers the first year — it’s worth growing them as annuals. I always save my seed packets so I can remember the varieties that did well. Lambada bee balm (Monarda ‘Lambada’) has tall stems with showy pink flowers that grow in tiers along the stem. Even the dried flowerheads look great in the winter garden. Chances are good that this plant won’t be perennial in my garden, but it makes a worthy annual. I started all of these plants in the 24-cell GrowEase Seed Starters. Because winter lasted longer than usual, I ended up “potting up” the plants into 4″ pots to grow a couple weeks longer. By Memorial Day, I had some beefy transplants. 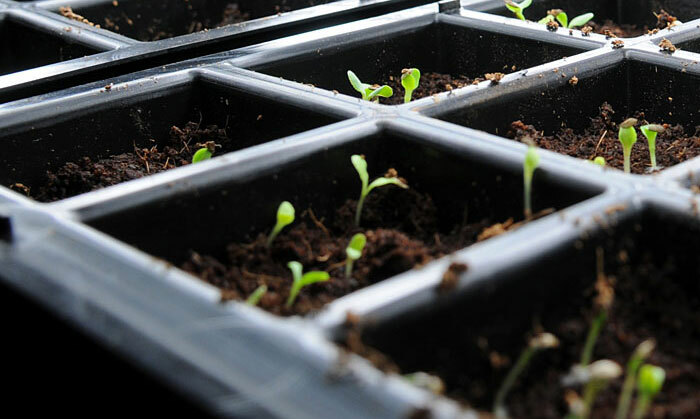 Seeds germinated quickly in the GrowEase trays, under lights in my office. Grow Pumpkins in a Pot — Will it Work? Yes. New for 2015: Kale on a Stick?